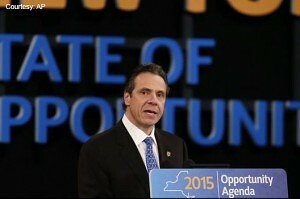 NEW YORK – Following a year wrought with natural disasters, auto and product recalls, and thousands of New York car accidents, New York State Governor Andrew Cuomo said he would like more focus put on public safety. At his state of the state address on Tuesday, Cuomo asked lawmakers to budget more than $50 million to help battle weather emergencies. A November storm that dumped 70 inches of snow on Western New York also caused motorists to be stranded, roof collapses, flooding, and at least a dozen deaths. “In the case of a weather emergency, we need the right equipment,” Cuomo said. Cuomo is calling for a new fleet of snowplows equipped with GPS to clear highways of snow and ice quicker and more effectively. Several assemblymen and state senators have already drafted dozens of bills that would improve public safety on the roads. More than 100 bills would retune motor vehicle laws, if passed. A handful of bills, drafted by assemblymen and senators from New York City and Long Island, would outlaw any significant accumulation of snow and ice on cars operating on public roadways due to risk of injury or car accidents. In the wake of these winter disasters, Cuomo is also requesting new laws that would require all emergency responders to be retrained. Several motorists died, stranded in their vehicles during November’s snow event. The governor hopes his new public safety plan, part of a $142 billion budget, will help save lives in the event of another storm. 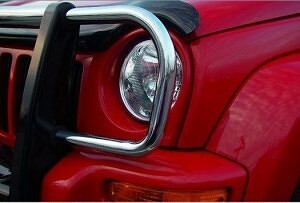 DETROIT – Jeep vehicles continue to be linked to deadly collisions more than 18 months after Chrysler issued a recall. Many Jeep Liberty and Grand Cherokee vehicles were recalled when it was found the gas tanks can explode during rear-end collisions. According to Bloomberg, more than 1 million of these models have not been repaired yet and at least six people have died in highway crashes since the June 2013 recall. The original recall includes 2002-07 Jeep Liberty and 1993-98 Jeep Grand Cherokee SUVs. National Highway Traffic Safety Administration (NHTSA) Deputy Director David Friedman said in November that only 3 percent of the 1.56 million affected vehicles were repaired in a six-month period. Bloomberg puts that repair rate as the lowest for any recall of more than 1 million vehicles in the last five years. Bloomberg estimates a total of 62 people have died from injuries related to Jeep’s exploding gas tanks. Q: I am 19 years old. I was in a car accident when I was 5, and I was left with a bad scar on my forehead. My parents never took any legal action on my behalf. Is it too late for me to make a claim? A: Probably not. While there may be some exceptions depending upon circumstances, in New York the statute of limitations for motor vehicle negligence is three years from the date of the accident. However, since you were a child when your accident happened, your statute of limitations did not begin to run until your eighteenth birthday. This means that you will likely have until your twenty-first birthday to make a claim. We would caution, however, that you should contact an attorney immediately because it would not be wise to allow more time to pass without securing your legal position. Your attorney’s ability to investigate the accident has already been compromised by the passage of time. You should contact a car accident lawyer now so that he or she will have the best possible opportunity to protect your interests. Ask the Attorneys: Honor Student Suffers Head Injury in Auto Accident: Is There a Case? Q: Last summer I was driving on Niagara Falls Boulevard. My 16 year old son was sitting in the front passenger seat with his seat belt on. While we were passing through an intersection on a green light a car ran the light and struck my car on the passenger side. My son’s head hit the side window hard enough to break the glass. We were both checked out at the hospital, and they kept my son over night for observation. He did have a concussion, but the CAT scan of his brain was negative. Since the accident my husband and I have noticed that our son has just not been the same. He was always an honor student, and now his grades have dropped off. It also seems as though he is much more irritable than ever before. At first, we thought that these changes were perhaps just due to adolescence, but now we’re not so sure. Is it possible that he suffered a brain injury in the accident, and if so do you think that he has a case? A: We would strongly encourage you to have your son evaluated by a neurologist and a neuropsychologist. Even though the CT scan that was done at the hospital was negative, a neurologist may want to order an MRI. This is a different diagnostic test, which may provide different information about whether your son suffered an organic brain injury from the blow to his head. A neuropsychologist will be interested in the results of the diagnostic studies, but he or she will address your son’s issues from a different perspective. Typically, a neuropsychologist will put the patient through a battery of tests for the purpose of determining whether a brain injury is causing the changes which you have observed. We have a number of clients who have suffered head trauma where there has been no clear evidence of brain injury on CT scan or MRI. In these cases we have found neuropsychological testing to be very valuable. The personal injury attorneys at Cellino & Barnes help car accident victims get the justice they deserve.